Are you bored of usual looking text? Add some fancy attribute to plain text by changing its direction. You can flip text upside down or write it in reverse. This can be easily done using free online tools or offline download-able programs. Checkout following listing to flip and reverse for some text play. 1. 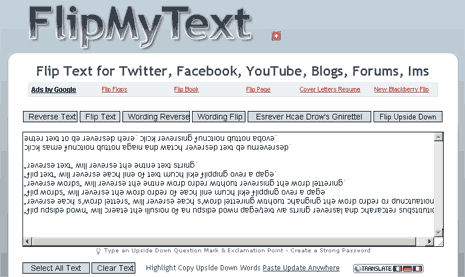 FlipText.org – It is a basic online tool for flipping text upside down. 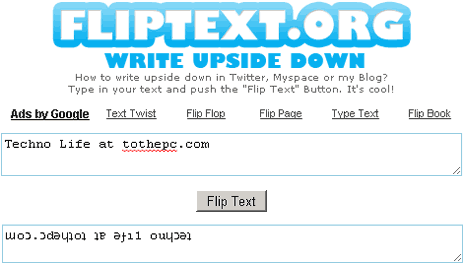 Just write any text and click ‘Flip Text’ button to view the same text upside down. 2. FlipMyText.com – It is more advanced online tool with lot of options to play around with the text. You can flip text upside down, wording reverse, flip wording and much more. 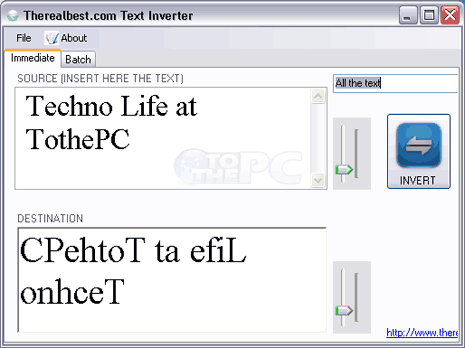 If you prefer offline apps, then checkout Text Inverter from Therealbest. Download this free program to reverse or invert text as whole or word by word. It has simple and very easy to use interface. If you are still in love with flip action, how about flipping whole webpage in Chrome? or how about flipping your favorite video in any direction! Another one good addition to your list – anyaim.com/tools/text/reverse_text Reverses and flips text five different ways.